← 592 "How Lisa Got Her Marge Back"
Assistants wanted. Must be pretty and soft slapper. No dudes. Ralph flies away on a kite, wearing a Charlie Brown shirt and saying "Take that, Kite-Eating Tree". "Fland Canyon" is the 19th episode of season 27 and it aired on April 24, 2016. "Homer recalls a tense family vacation to the Grand Canyon with the Flanders family. 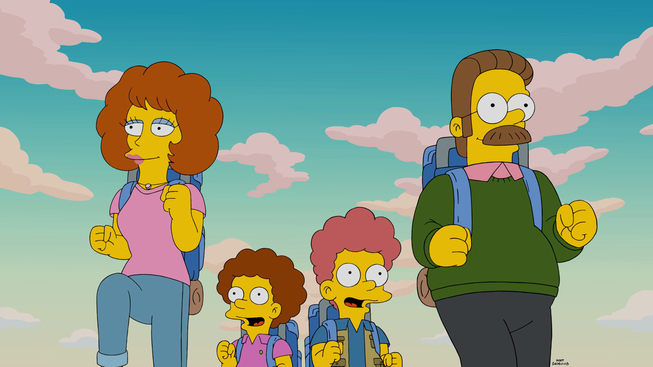 At first, the Flanders' perfection puts the families at odds, but when they get stranded and Ned and Homer go for help, the families finally bond." 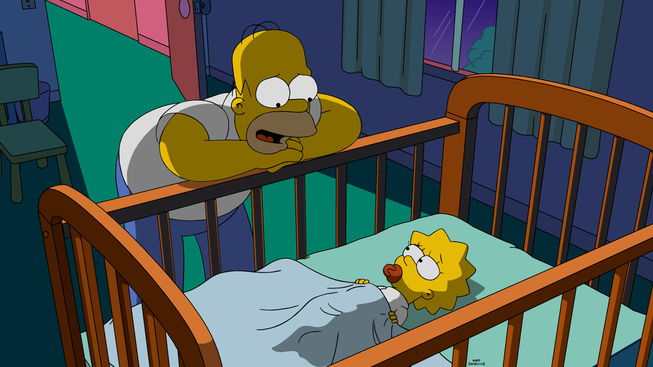 Homer tries to put Maggie to sleep, but fails multiple attempts. Maggie tries to make him read Little Red Riding Hood as a bedtime story, instead Homer starts telling her the story of their vacation at the Grand Canyon with the Flanders. 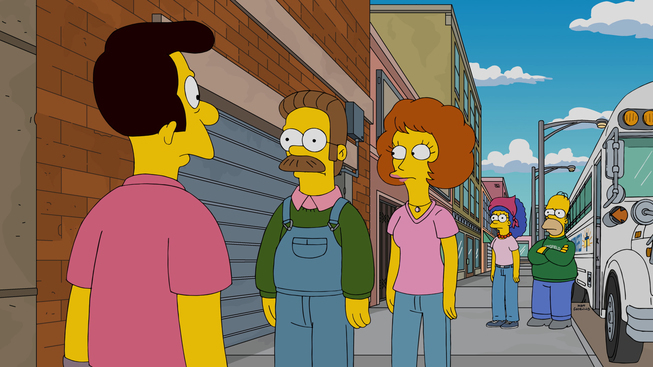 The story starts two years earlier, with church people volunteering to clean Springfield skid row on a Saturday, with Homer protesting for the church making people work for it on Saturdays. At the end, Ned wins a family trip to the Grand Canyon for being the most selfless cleaner. The vacation was a trip for two families, so he tries to invite the Lovejoys, but with Helen refusing, Reverend Lovejoy convinces Ned to take the Simpsons with them to the trip. On the journey to the Grand Canyon, Homer, after drinking a lot, stops at a public toilet, using it for a long time, with a bear waiting in line too. 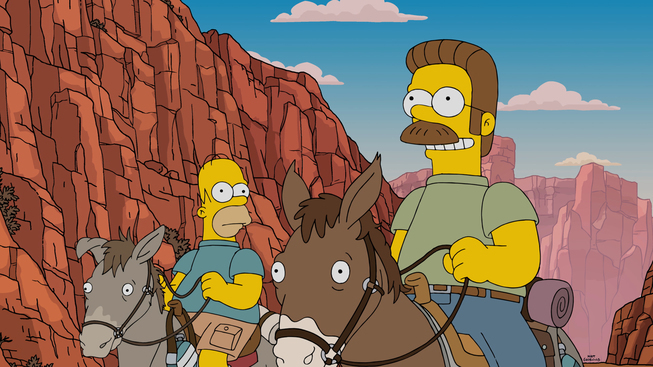 At the Canyon, after Homer and Bart fight with a snake and scorpions, they admire the great view, with Homer commenting that they say America run out of room for garbage, while the Flanders arrives singing Go Tell It on the Mountain. 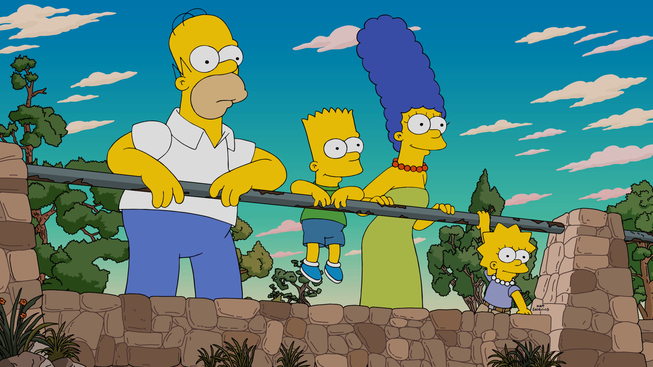 The two family are not getting along very well, after Maude comments on Bart's bad behavior at the dinner, the prank on the bridge and with her kids while riding the mules along the Canyon. During the trip on the mountain, a group of millionaires passes by to go camping and using the Canyon as they want, and the tour guide falls off the cliff with most of their supplies, leaving the two families stranded. Maggie is exhausted and finally falls asleep, but Lisa surprises Homer from behind and says she wants to know the rest of the story. Ned and Homer decide to search around for supplies and arrive at the millionaires' camping site. Around the site, replete of tents from various TV companies, Homer convinces Ned to steal some of the supplies and escape using a raft. After the ride back, they wake the family up with a rich banquet, including Lisa eating meat. Lisa comments to Maggie that it was before she became vegetarian. At the end of the vacation, Homer and his mule say good-bye to each other, after the mule took his heavy weight through all of the journey, and Homer and Ned comment on their friendship. Back in the present, Ned speaks through the window, having heard the whole story, and Homer reminds him that he still owes the Flanders a trip. Homer manages to get Maggie asleep with the story, but Lisa wants to know what happened next, so Homer continues telling the story. 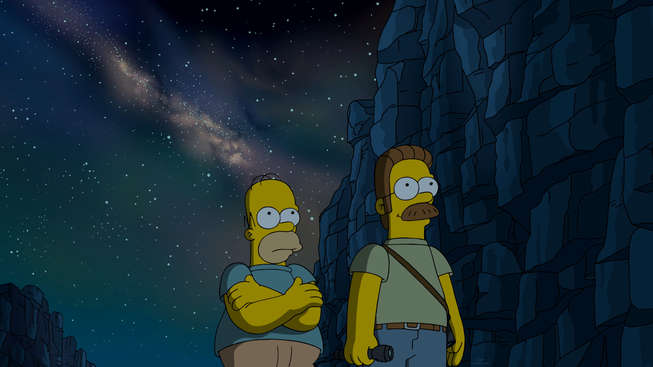 At the Canyon, Ned and Homer decide to look for supplies when they found the millionaires' camping site. Homer convinces Ned to steal their food and supplies and escape down the river using a raft. They manage to reach their camping and surprise everyone with a breakfast with caviar and bacon. Later they were rescued and Homer and Ned talk about their friendship. Several locations postcards are shown, only to then show that the Simpsons took the Flanders to the postcards museum, that doesn't sell postcards at the gift shop. Modified on July 11, 2016, at 22:55.